At water’s edge, gazing at the bubbly foam. As we search far and wide to look for our food. And promised to keep it from all danger. And vowed to protect it from all strangers. The wand slipped away, without detection. But the shiny wand was now gone. Oh, no! it’s lost at the bottom of the pond! But he knew that he mustn’t stay fraught. Froggie had let down his Raven friends. He grasped his heart, “I’m so sorry,” he thought. And held his breath and swam down deep. Finding only twigs, he piled them in a heap. But he knew that he must not stop. Found the wand! and swam to the waters’ top. Now tightly holding their magic wand. “You worked so hard to find what was lost. The end of the story can now be told. As friends they remained in their woodland haven. 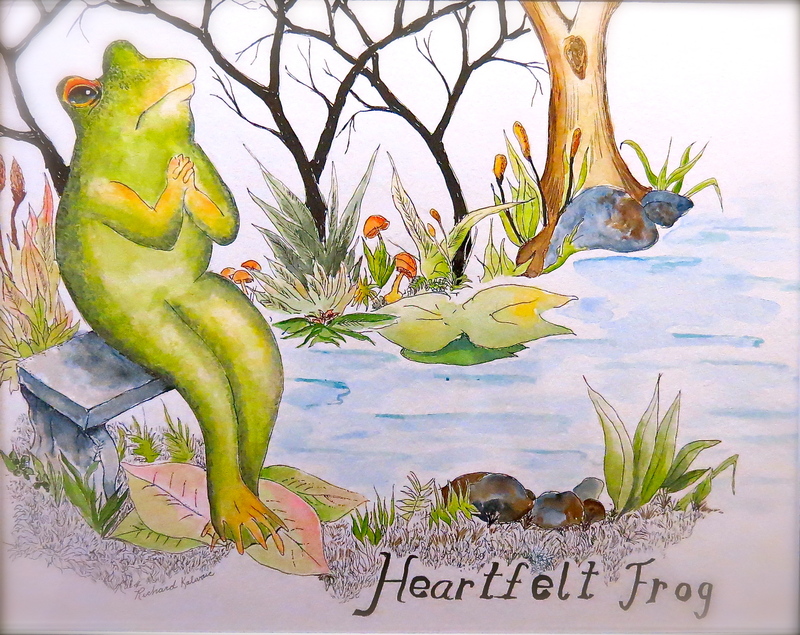 For this we’ll remember–the Froggie and the Ravens. When I was a child, the book I treasured most was The Bumper Book: A Harvest of Stories and Verse. The condition of my book would not command the $350 that this vintage edition is selling for on eBay: the binding is gone, pages are torn and the cover is well-worn. Published in 1946, and given to me for my fourth birthday, these stories, fables and poems were my bedtime companions. “Wynken, Blynken and Nod” by Eugene Field, “Animal Crackers” by Christopher Morley and “The Swing” by Robert Louis Stevenson were some of my favorites. The colorful illustrations, printed on heavy glossy paper, fascinated me, drawing me into the stories because of the sweet depictions of the children in their vintage clothing. 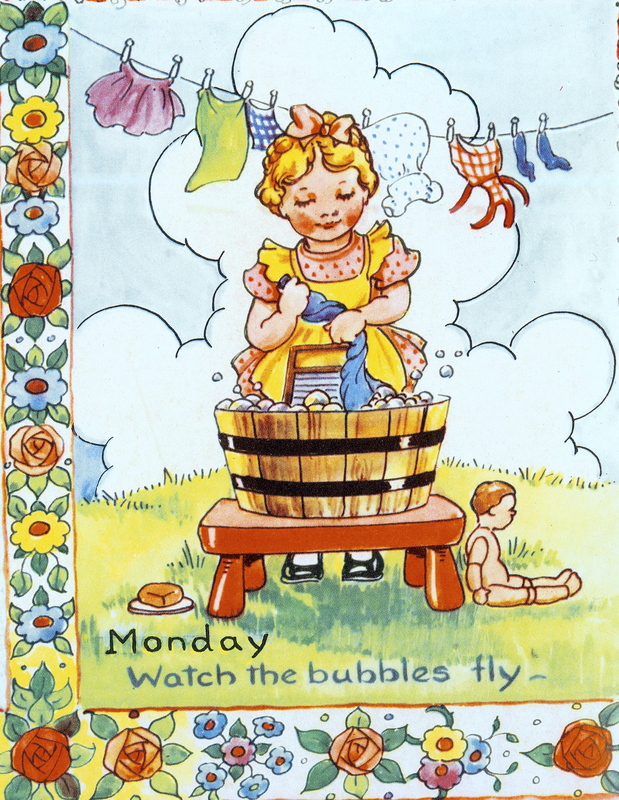 One particular poem featured vignettes of the days of the week, illustrated with a little girl doing chores for each day. 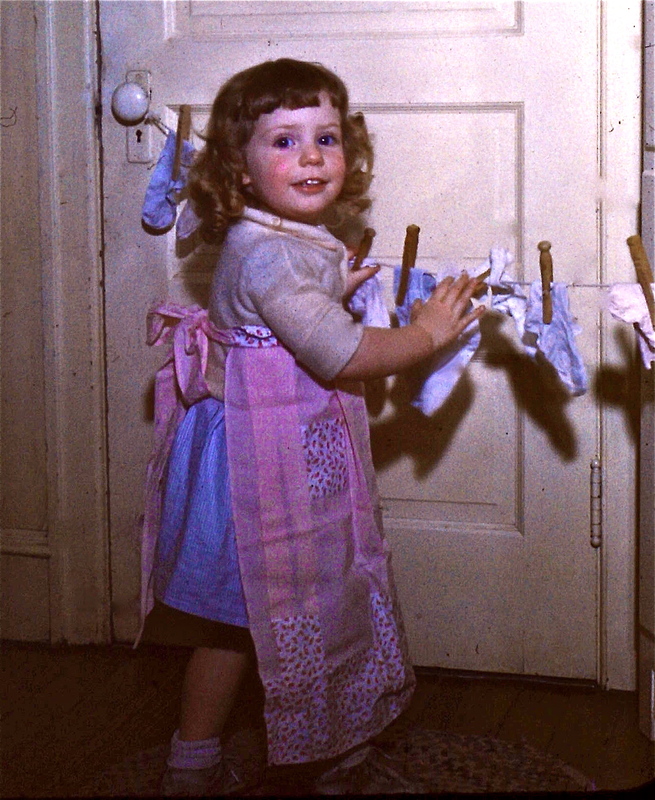 Around the turn of the 20th century, women’s chores were assigned a day of the week, as described on the blog, A Hundred Years Ago. When I was a child, I loved play houses, and the settings in these illustrations seemed to take place in child-sized surroundings. I marveled that somewhere children played in these finely crafted miniature homes. Saturday, Good for cakes and pies. After church we have our tea. Because the little girl was cleaning and cooking in these picture frames, I wonder about the message that gave me about preparing for the eventual role of running a house. And then I wondered again, was that such an unfortunate model? Regardless of our path in life, we do have to take care of a home, either as a single person or with a partner and children. 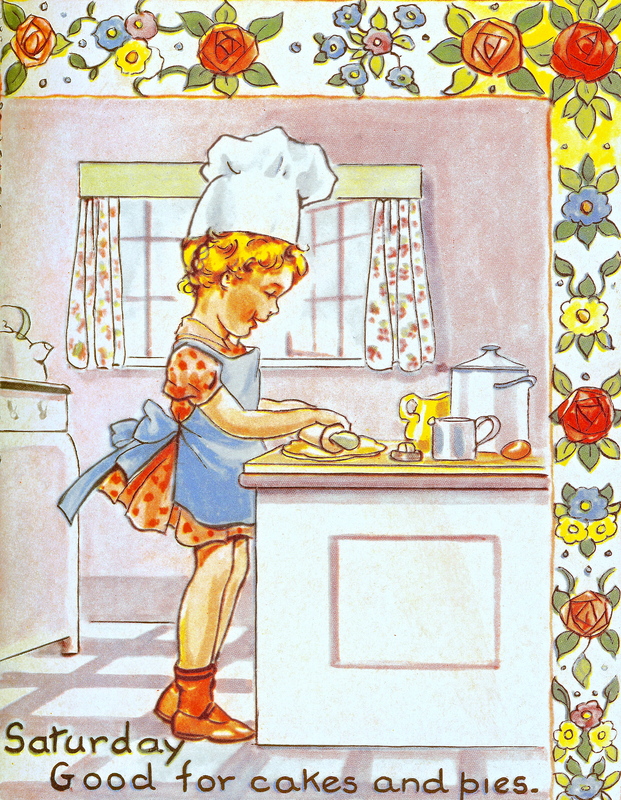 Of course, the drawings would have been more socially progressive if she had a boy to help out. In our hierarchy of important jobs, our culture views work inside the home as a lower value. Yet today, with so many demands on our time, managing a home is a difficult responsibility. Cleanliness, orderliness, household finances and meal preparation offer considerable challenges. Work inside the home is the glue that keeps any society held together. This is honorable and necessary work that is best shared by all in the household. 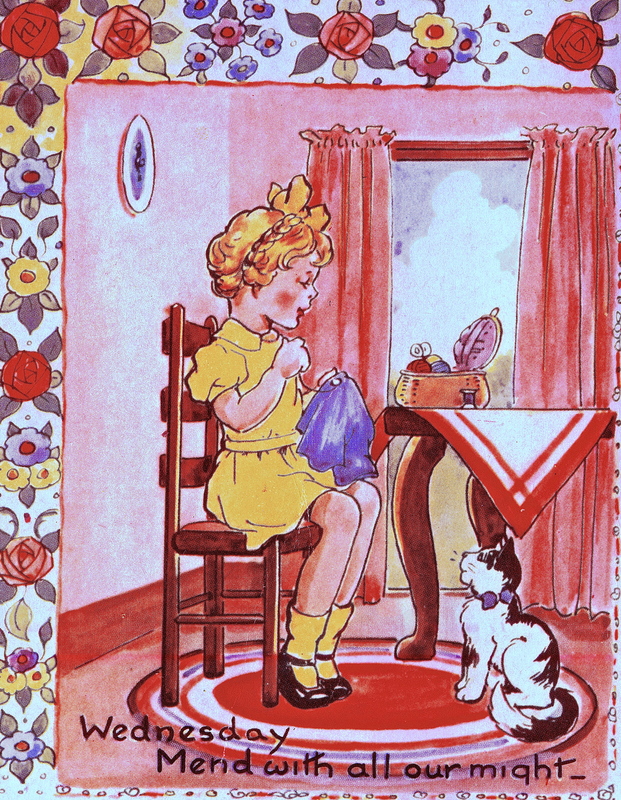 Eulalie Banks illustrated over 50 children’s books during her long lifetime. Never a great artist, she was always a popular one. Interesting how the terms never a great artist, fill the second line. Really? I’ve seen many testimonials on the Internet to the Bumper Book, as adults reflect on how the stories and artwork became part of their childhood. Many, like myself, read the stories to their own children. The delightful illustrations offered a window into a rich fantasy world, enhancing the writing of the authors and poets. 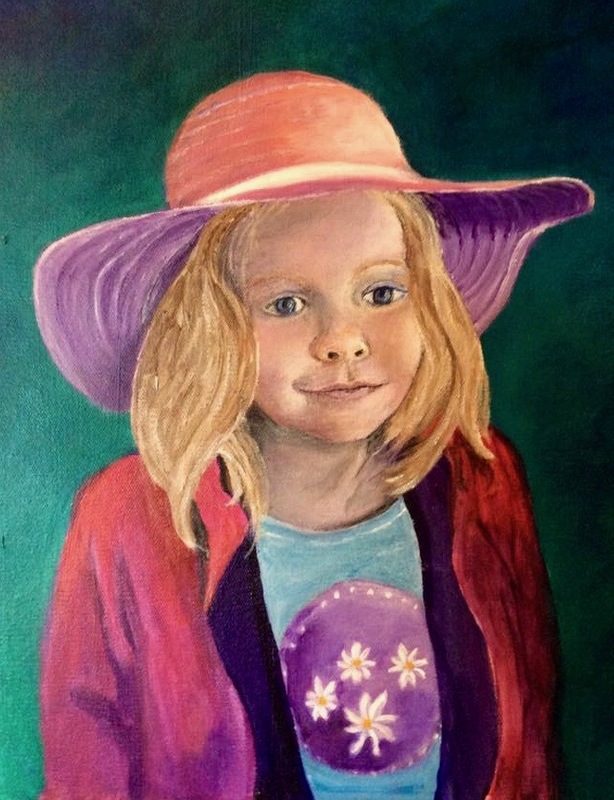 Conventional interpretations of greatness rarely include the breadth of experiences of children, which would lead to wider interpretations of artistic influence and “greatness”. 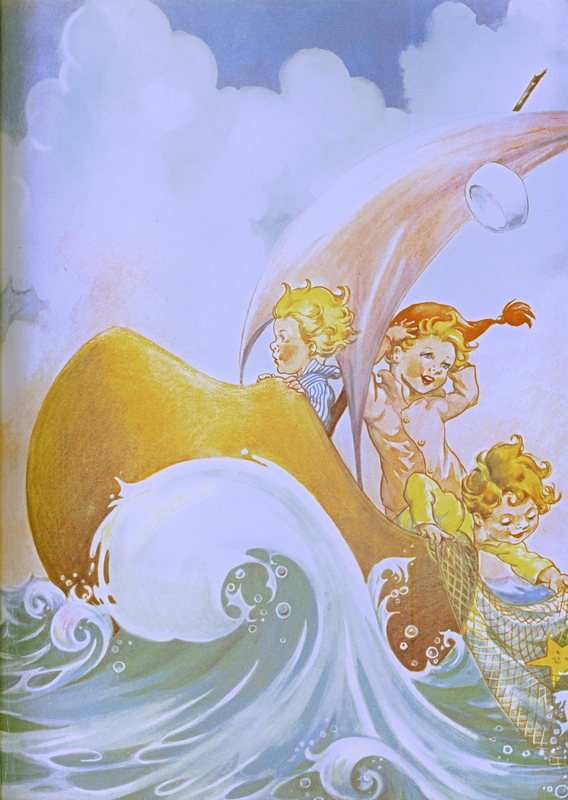 Children’s Books Online: The Rosetta Project: Largest Collection of illustrated antique books on-line . . . we think.